Has a girl truly become No One? The battle hasn’t happened yet, but it looks like the war is already lost. A terrifying new Game of Thrones teaser shows us the graveyard formerly known as Winterfell. And yes, we know, artistic license—this isn’t necessarily a spoiler for things to come. But if this is the way things may go for our beloved heroes, let’s just say it’s going to be a Long Night. HBO has been sharing a series of teasers in anticipation of the eighth and final season of Game of Thrones. Most of them have been focusing on getting ready for the war to end all wars: the fight against the Night King and his army of the undead. But this latest one, which doesn’t seem to feature any footage from the show itself, simply took my breath away. It’s a quiet journey through the abandoned halls of Winterfell, clearly taking place after the battle we all know is coming. 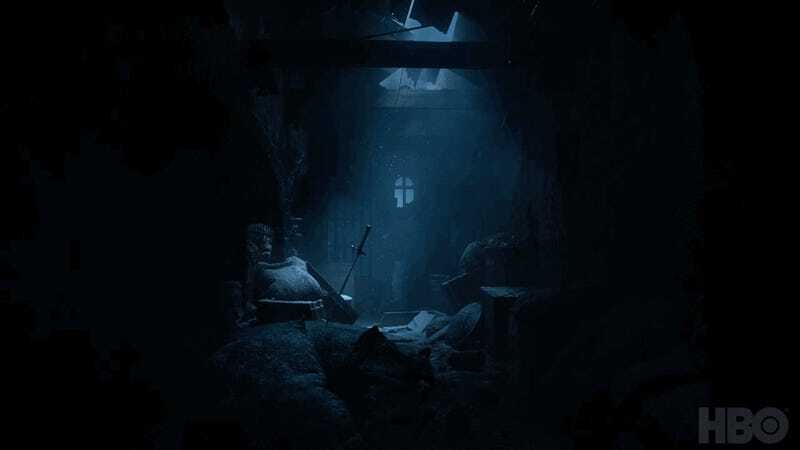 As we see the frozen remnants of warfare, the eerie silence broken only by whispering echoes of a battle long gone, we see Arya Stark and Jon Snow’s swords lingering among the ash-like snowflakes. In the distance, a figure approaches. Cold and deadly, wearing a bone-like crown atop his decaying head. Scary. And if that wasn’t enough, here’s an extremely ominous new poster, too. Brr! Game of Thrones returns on April 14 with its six-episode final season.